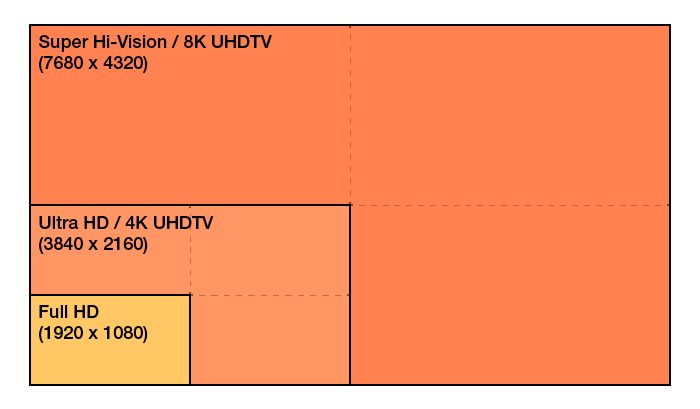 The 8K resolution that NHK proposed years ago, in anticipation of international standardization, represents four times the resolution of full HD, or 7680 x 4320. In 2006, it was incorporated in an ITU-R recommendation on 8K resolution, and in 2012, it was recommended as an international technical standard for television. Although NHK publicity about 8K refers to the resolution as Super Hi-Vision (abbreviated SHV), ITU-R recommendations identify it Ultra-high-definition television (8K UHDTV). Both 4K and 8K formats are covered in ITU-R recommendations on ultra-high-definition television. Only the resolutions differ, and other specifications of 4K and 8K are the same. Progressive scanning is used, as is the ITU-R BT.2020 color gamut and frame rates of 30, 50, 60, 100, and 120 Hz. Again, in areas where a drop frame is used, compatibility with existing frame rates is currently maintained by including support for 29.97, 59.94, and 119.88 Hz drop frames.